Each season there is a list, white dresses in the summer, bordeaux colored pants in the fall, cozy oversized cable knits to match the snow. Spring is when I usually begin my search for sandals. I've been in the market for a new pair of wedges for what feels like ages, still haven't found the strappy tan sandals of my dreams, and could definitely use a pair or two that are walk to work friendly. So this week, instead of composing a full outfit, I've rounded up a bunch of sandals I've had my eye on. Apparently, I've got a thing for neutral hues this season, but you know what? They go with everything so you won't be struggling in the morning to build an outfit around them. This simple flat strappy pair would make a great walk and wear anywhere sandal and I love lace detail on this pair. It's simple but sweet with a comfortable heel height. And I know these fringed Tibi mules are a bit over the top, and I can think of absolutely no occasion to wear them, but why not? They're fun and different, definitely a statement shoe. Please share if you've found the perfect pair! I absolutely love those thong sandals at the top! Number 3 is definitely on my wish list! I was actually hunting for sandals today but didn't have any luck. Those fringe ones are amazing!!!!! Love your roundup! 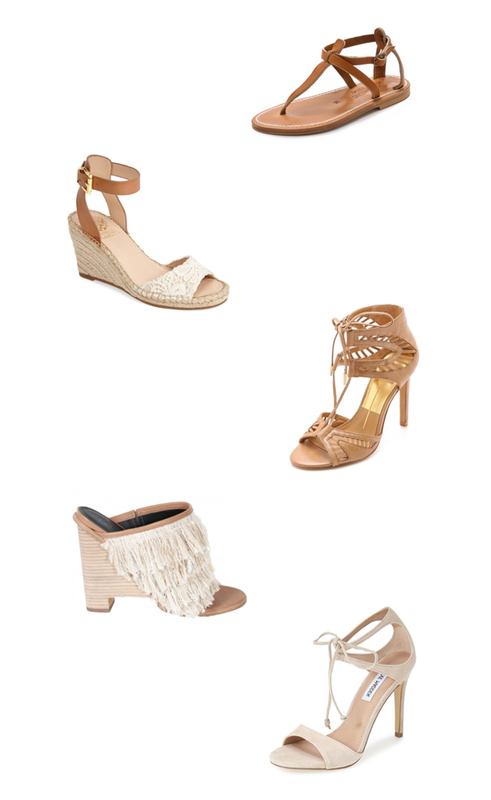 Loving all of these but I can't get over how gorgeous those fringed Tibi mules are. WOW!! Love the steve madden sandals at the end! I love all these sandals! Esp the 1st pair!